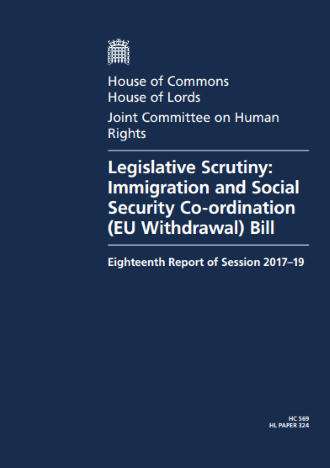 The House of Commons Joint Committee on Human Rights yesterday published a report looking at the impact of the Immigration and Social Security Co-ordination (EU Withdrawal) Bill 2017-19. You can read the 28-page report here. For useful background on the Bill, see the House of Commons Library briefing from January here. While the outcome of Brexit currently remains uncertain, the Bill would end EU free movement and repeal other retained EU law relating to immigration. In its report, the Joint Committee on Human Rights warns that the Immigration Bill as it stands will strip EU citizens in the UK of important rights after Brexit. The report states: "The Immigration and Social Security Co-ordination (EU Withdrawal) Bill removes all EU free movement of persons rights, without addressing the rights of those who currently benefit from EU free movement of persons rights under EU law, including social security rights. This includes the rights of those who have resided in the UK for many years or even decades, working in the UK, paying into our social security system, and even having been born in the UK and lived here their whole lives." In strong criticism, the Committee said it is not right to leave EU citizens in a "rights limbo", with no guarantees that their rights will be replaced. The report warns: "Removing their rights with no equivalent legislative protection in place raises significant human rights concerns. These provisions could leave individuals and families in a situation of precarity as to their futures, including housing, social security and property rights." To address the concerns identified, the Committee proposes a series of significant amendments to the Bill which aim to enshrine these protections and guarantees in the Bill itself. Harriet Harman MP, Chair of the Joint Committee on Human Rights, said: "Human Rights protections for EU citizens must not be stripped away after Brexit. EU Citizens living in this country right now will be understandably anxious about their futures. We're talking about the rights of people who have resided in the UK for years, decades even, paying into our social security system or even having been born in the UK and lived here their whole lives. For example, the right to enter the UK and live here, to seek and get jobs, to access health care and to access education, are all up in the air. "When it comes to rights, promising that everything will be worked out in the future is not good enough, it must be a guarantee, which is why the Committee have reinserted rights guarantees back into the wording of the Bill."